Client injury from falling, due to: unsteady gait or sudden movement. Client injury from incorrect sitting or restraint in vehicle. b. Ensure area around vehicle is free of tripping hazards. c. Ensure there is enough space around vehicle to open its door wide and for workers and client to manoeuvre. 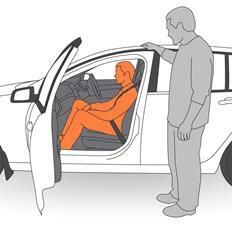 d. Where possible, clients who require assistance should be seated on the left-hand side of the vehicle. Ensure vehicle is parked on level ground, with enough room to open doors fully. 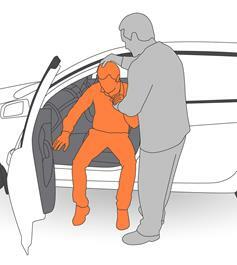 This instruction only describes how to assist an ambulant client into a vehicle. This instruction does not apply to a client remaining in a wheelchair to travel. Walk with client to vehicle. If client requires assistance to walk, assist them as outlined in the SWI Assisting a Person to Walk. Unlock vehicle and open door. 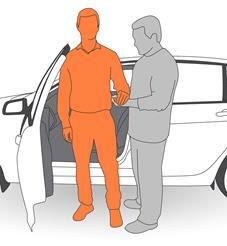 Position client beside open door of vehicle as in diagram. Assist client to sit back into vehicle. Worker to place client's left palm into their hand, with worker's thumb through for client to grip (thumb-hand grip). 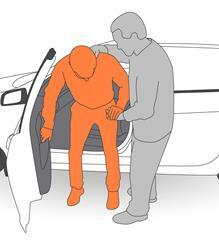 Ask client to use their other hand to grip inner handle of vehicle door for support. Worker to place their free hand at base of client's neck. Explain all steps to client as proceeding. Ask client to lean forward, bending their knees (see diagram). Worker to ensure client does not bump their head on vehicle roof as they sit down. Once client safely seated, release hand grip. Lift client's legs into vehicle. Worker to position themselves in front of seated client. Using a bended knee stance, place both hands on client's leg nearest door, then lift leg slowly up into vehicle, placing foot firmly on floor. Do not grasp leg with fingers, rather use open palm pressure. Worker to repeat process with other leg. Ensure client has turned their torso to face forward with legs. Worker to ensure client is comfortably seated in vehicle seat, with legs and torso all facing forward for travel. Worker to secure lap-sash seatbelt around client (or allow client to do if capable). Worker to get into vehicle, ready for transportation.